Posted 4 years ago on Thursday, April 9th, 2015 by James S.
If you use a shop vac for dust collection, you probably realize that if you just run it bagless, you eventually spit fine particulates out the back. If you have an enclosed shop, this isn’t particularly great for your health. You can put a finer filter or a filter bag from the home store on your shop vac, and these work great at catching this dust. Then, you have a second problem: the course dust plugs up these finer filters and fills the bags really quickly. This is where a dust separator comes in. 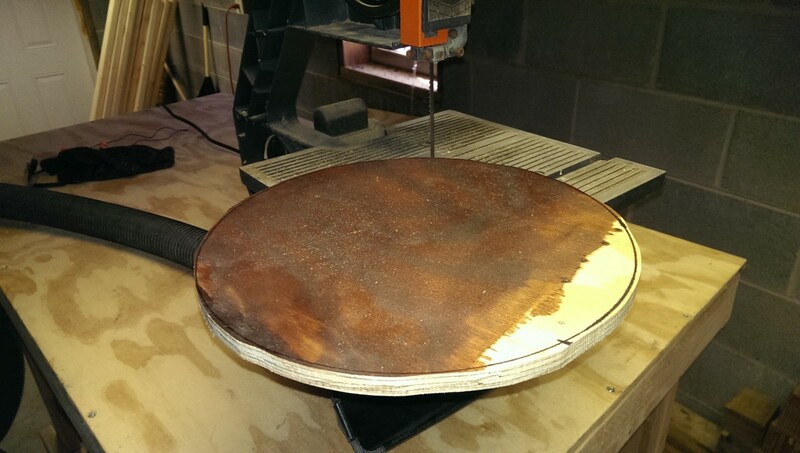 The idea is to have a chamber that is in-line between your tool and the dust extraction you’re using. 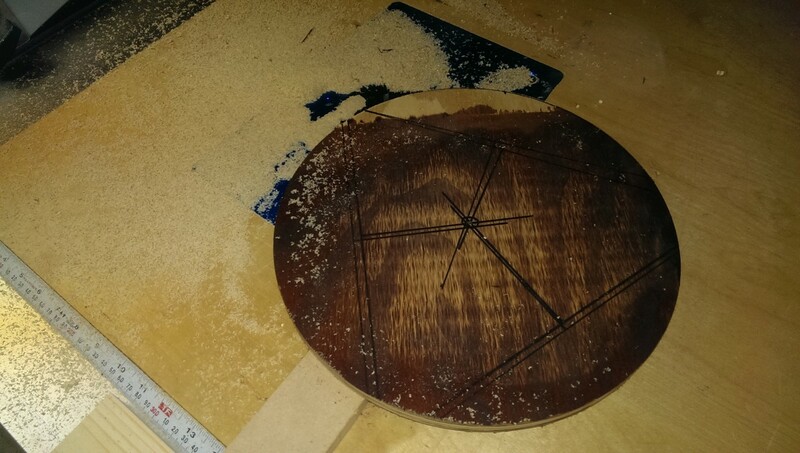 The chamber is intentionally shaped to circulate the incoming dust in a cyclone, allowing the heavy sawdust and other chunks to fall into a bucket. This is similar to how bagless vacuum cleaners work. If you put together something like this, you can catch a lot of the big stuff before it ever hits your shop vac filter. 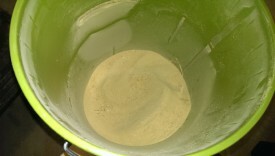 It will fall to the bottom of a bucket, which you can easily pour in the trash, and save your filter for the really fine stuff. There are products like the Dust Deputy that you can purchase to do this job. However, as of this writing, they’re $50 + parts or $99 for a complete kit on Amazon . Honestly, that’s more expensive than I’m willing to pay. Phil Thien made a DIY dust separator design. A lot of guys have put this together, and it gets great reviews. 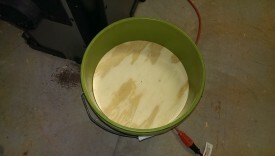 I was able to make a similar separator using only scrap plywood, some dirt cheap PVC and elbows, and a $2 bucket. Total cost was probably in the neighborhood of $20. So far it’s been working great. I planned to have the separator sit on top of my shop vac, so I can roll them both around. 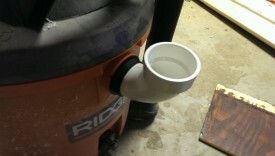 I’m also too cheap to buy proper shop vac hoses, etc, so I wanted to improvise with as much cheap PVC pipe as possible. 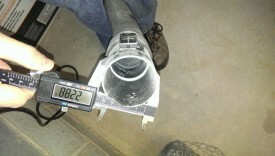 I got out my handy dandy digital caliper and simply measured the shop vac opening and hoses. The only keys are that I could find some PVC to hook into the shop vac opening, and that I could find a fitting the hose could connect to on the separator. 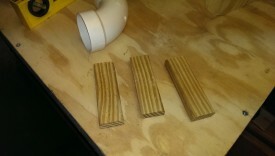 I ended up going with a length of 2″ straight PVC, four 90-degree 2″ elbows, and a flexible 2″ coupling. 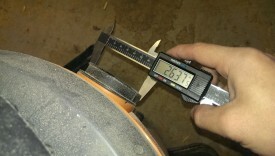 Bringing the caliper to the store, though, made it easy to figure out the fittings that would work. 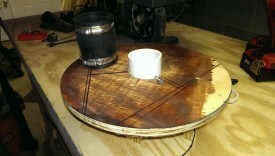 The cyclone itself will require three wood circles; I used some scrap plywood. 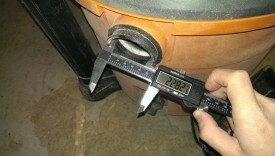 The first should be as wide as the bucket, to hold the whole thing on top of the bucket. 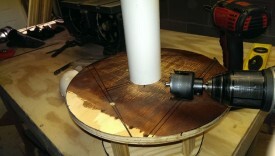 The second should be just as big as the inside diameter of the bucket, to glue under the first. 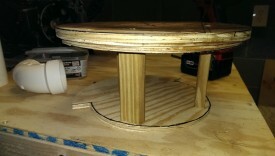 The last should be a bit smaller still, to fit down in the bucket and form the bottom of the cyclone. So, the first step is to size and cut the topmost circle. 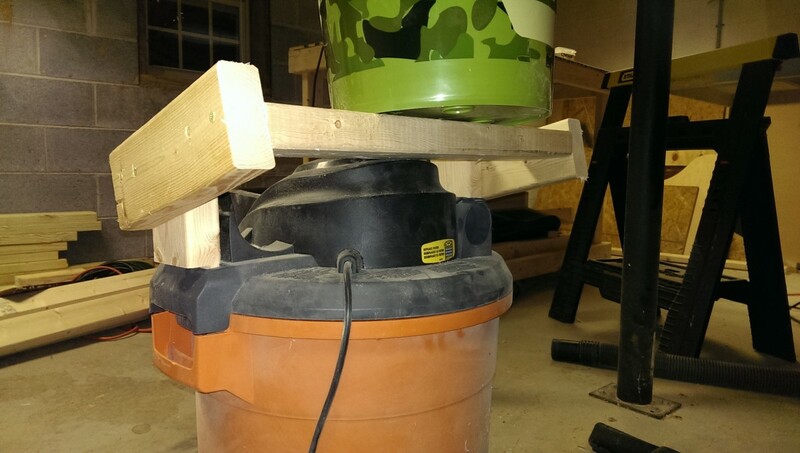 You can really use any bucket or trash can you want for this project. I used a 5-gallon bucket I got for free from Napa when I bought some oil. 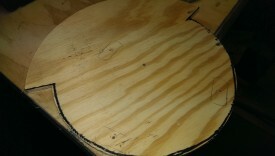 Step 1 here is to simply put the bucket on the plywood, and trace it. 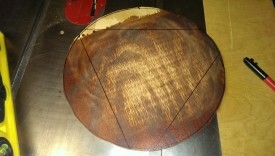 You then rough cut the circle. Accuracy isn’t critical here as long as you stay outside the line – I finish the circle on a router table. 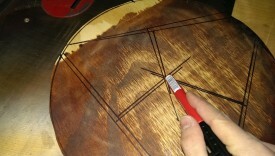 The goal here is to simply remove the majority of the wood around the circle. 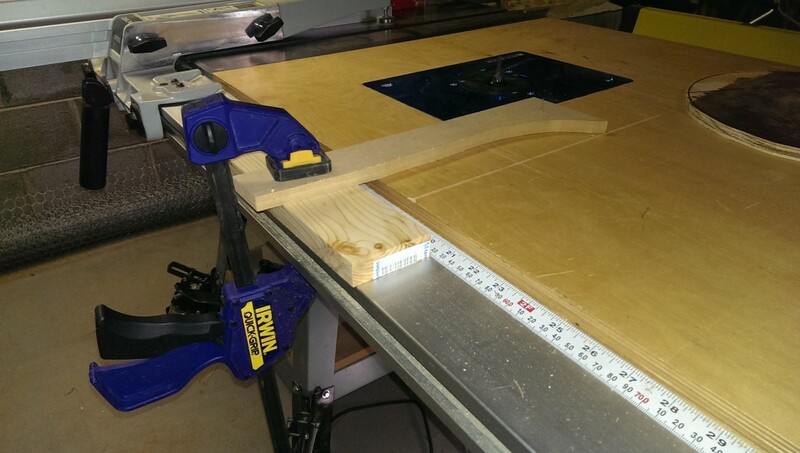 If no bandsaw is available, a jigsaw could do the same task. The next step is to find the center of the circle, to drill a hole in it. 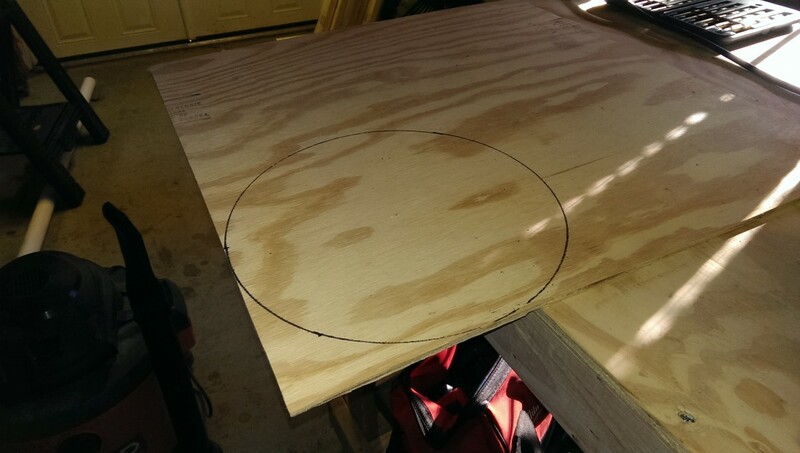 You’ll have a small amount of room for error on this, since the router circle jig will make a perfect circle regardless of where the hole is, as long as there’s sufficient material around it. Still, it’s easy enough to find the center. 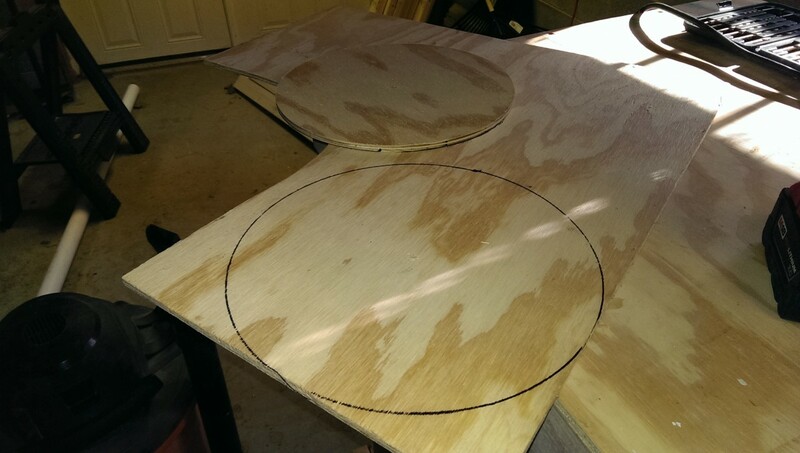 At this point, you need to make a circle jig if you don’t have one. They’re expensive, so I did this instead. I simply grabbed a piece of scrap and put a small nail in it. I drilled a hole the same diameter as the nail into the center of the circle I marked earlier. At this point, it was a simple matter of putting the circle’s hole on the nail, and then clamping the whole thing down where it just barely met the router. 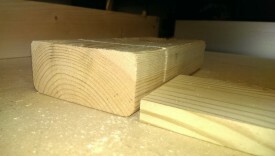 Turn the router on (WITHOUT the wood touching it yet – turn it to a shallower place to start). 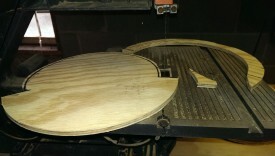 You can at this point spin the wood, feeding it into the router. 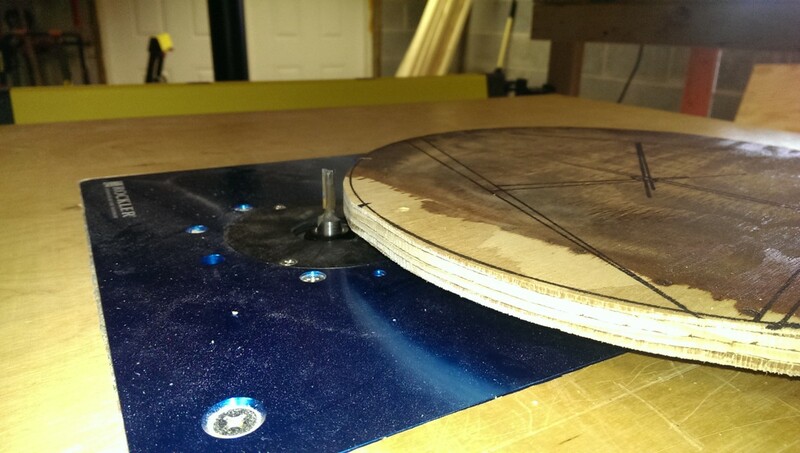 When you make it all the way around, you can turn the router off, adjust the jig to cut deeper, and keep going until you’ve got your circle. 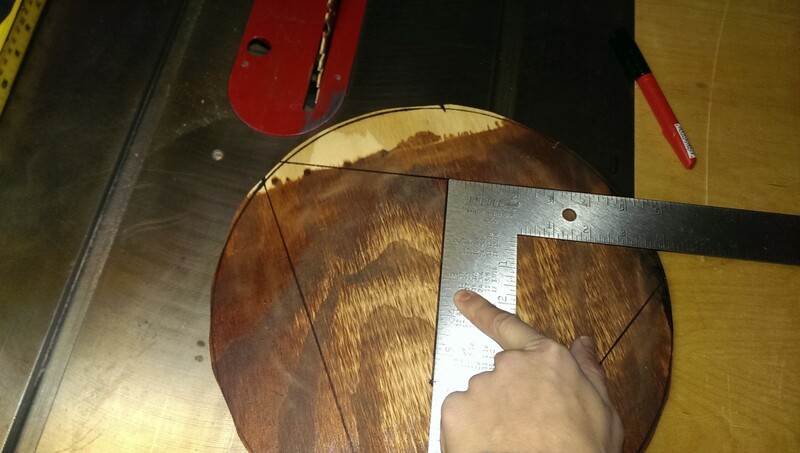 Once this is done, you should be able to test-fit the piece. It should fit right on top of the bucket as pictured. 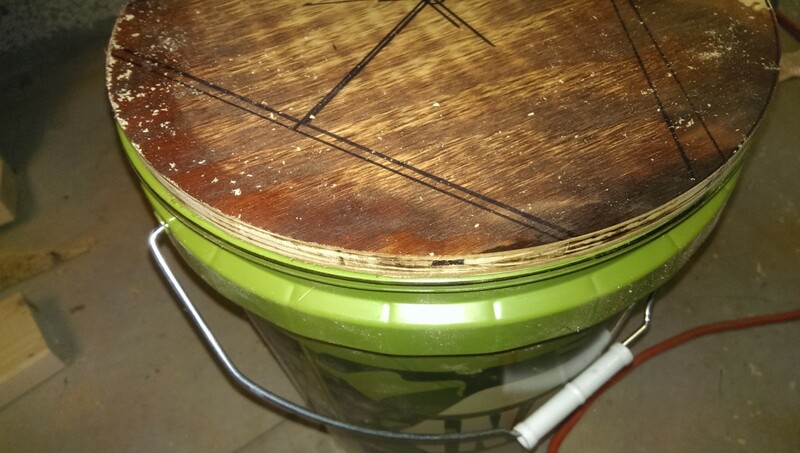 Now we need a circle to glue to the top lid that fits just inside the bucket. This helps stabilize and hold everything in place. 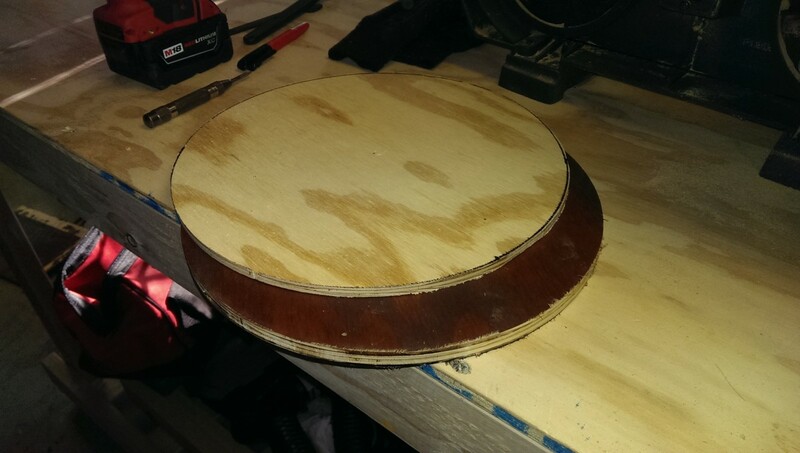 The procedure is largely the same: I traced the top lid on some plywood, rough cut it with a bandsaw, and used the router circle jig. 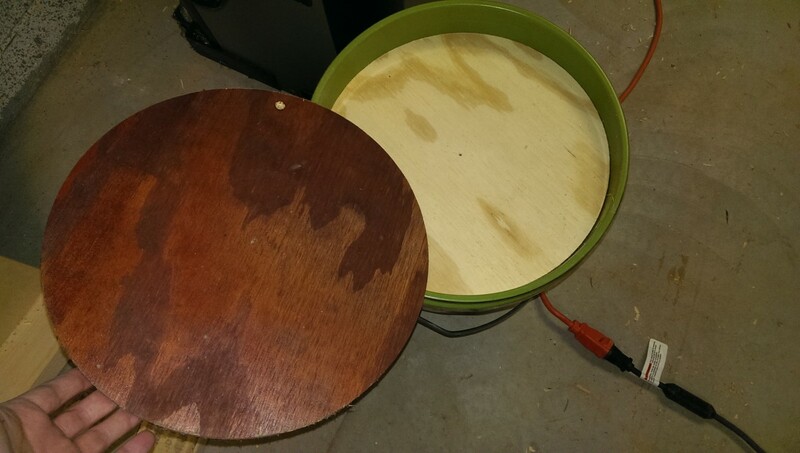 At some point, you’ll have a circle the same size as the top lid. 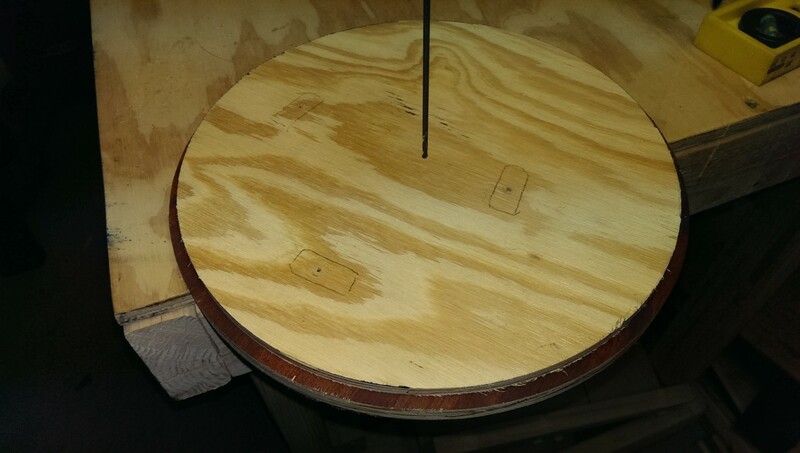 I simply kept making the circle smaller past this point, and test-fitting it against the bucket. Once it fit right inside the top of the bucket snug but not tight, mission accomplished. 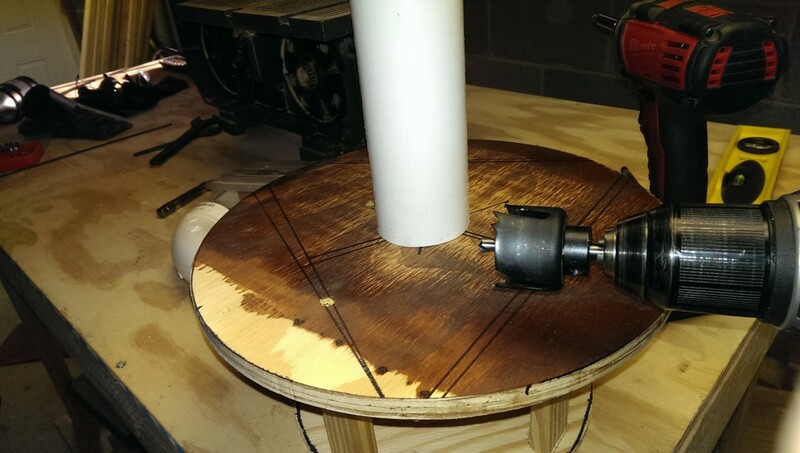 As Phil Thien says in his design, the baffle is a critical piece of the separator. 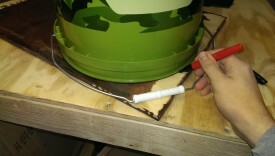 This allows dust whipping around the inside of the separator to drop into the bucket and not get picked back up. I started by making a slightly smaller circle than the last one. 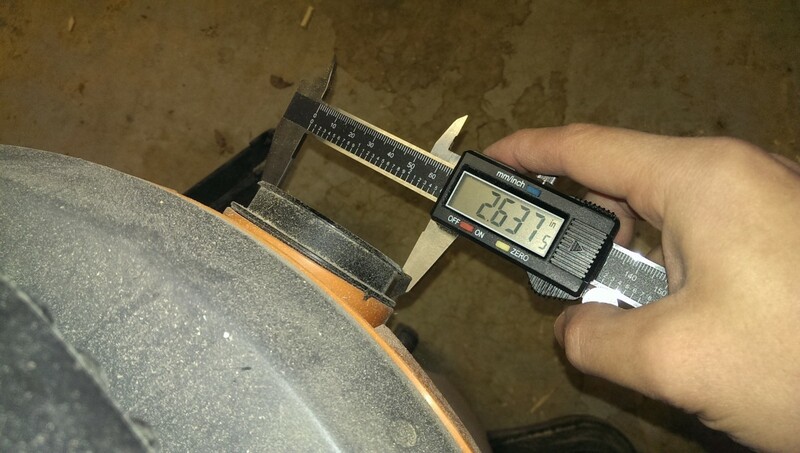 This needs to be able to drop about 4-6 inches down into the bucket. The procedure is identical to the last one. 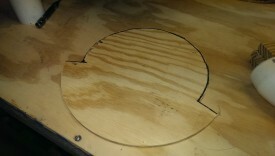 Part B here is to cut the baffle, which is basically a semicircular cutout that goes around approximately 2/3 of the circle. Obviously just use a compass if you have one, but I do not, so I just drew a bunch of dots 1″ from the edge and guessed at a semi-circle. 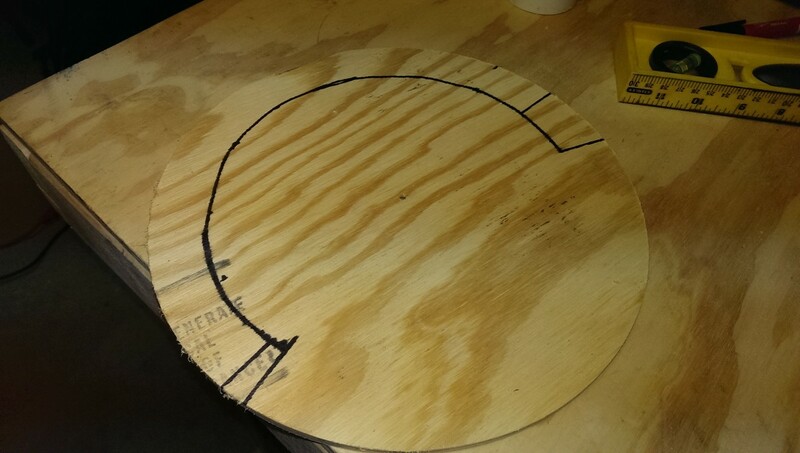 The good news is that accuracy is not at all critical here: like before, I used the circle jig to finish this up and make it perfectly circular. Next, I cut 3 scrap pieces of 1×2 (size isn’t important) to the same length to use as supports between the bottom baffle and the top lid. The goal was to eyeball how everything would fit prior to cutting the baffle, in case I needed to make changes. I also had the 2″ PVC elbow I was using to test fitment, along with some 2″ straight pipe that would later be cut to size. Thien’s design showed the elbow sort of pointing in the area with no cutout, so I went ahead and did something similar, mostly just eyeballing. At this point, the procedure is the same as before. I simply used the circle jig on the router table to incrementally cut the baffle until it was a nice, perfect circle. 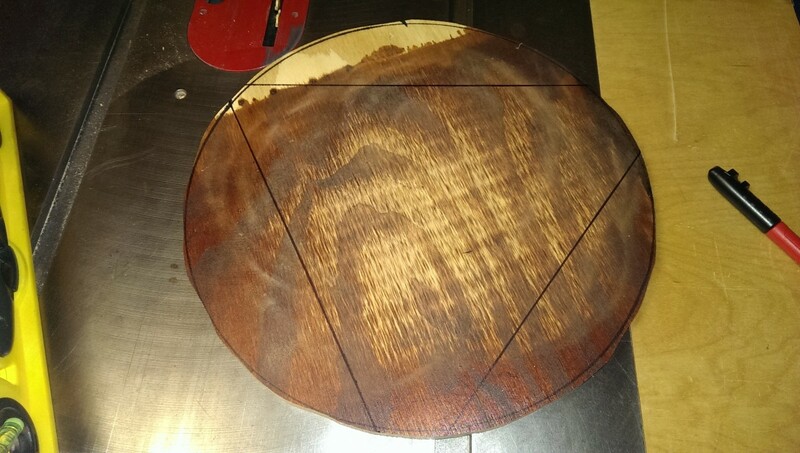 As you can see, my improvised semicircle as drawn was not quite a semicircle, but it didn’t matter – it was really there as a bandsaw guide, and the circle jig took care of the rest. 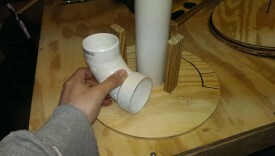 The next step is to get the supports attached to the bottom baffle. Based on the positioning done earlier, I had marked out where the supports were supposed to go. 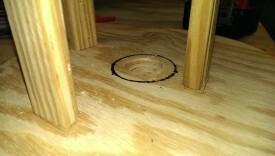 I drilled pilot holes through roughly the center of the markings and into the supports themselves. 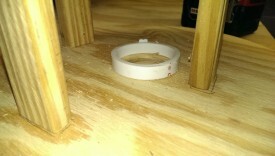 Then, I just glued and screwed them in place. 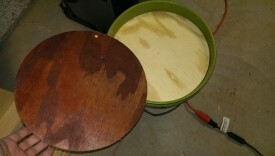 The top lid first needs to be glued into one piece, exactly straight. 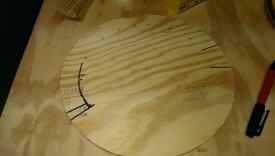 This is easy to accomplish by slightly enlarging the nail hole used for the circle jig earlier, and putting a drill bit or similar through both pieces. I then allowed this to dry before going on to the next step. 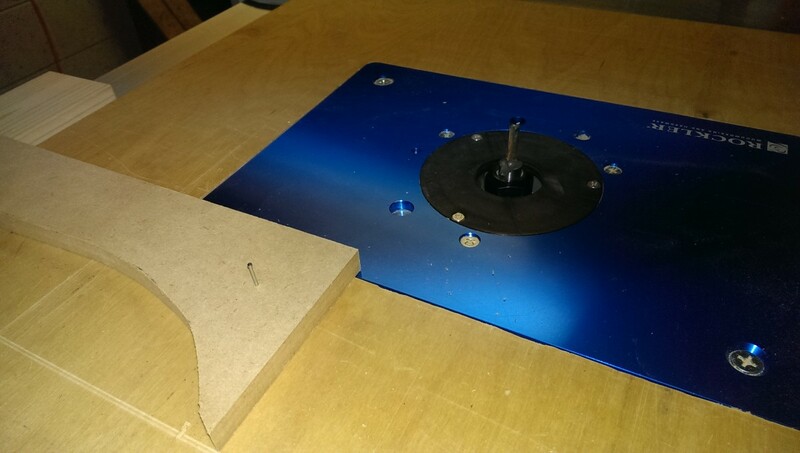 Connecting the top lid to the baffle now becomes a simple matter of using the long drill bit from earlier through the center of all 3 pieces to make sure everything is straight. 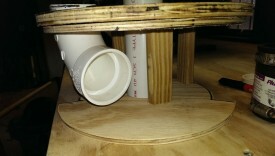 Then, simply apply glue to all 3 supports, drill pilot holes, and screw the top lid into the supports. Now you can use a hole saw bit to make two holes for the inlet and outlet ports. The ideal solution here would be to simply get a hole saw bit as big as the PVC you intend to put through the opening. This is what you should absolutely do. What you’ll do instead if you’re as cheap as I am, is use the one bit you happen to have in the shop, and then enlarge the hole on the router. Do not do this, it was stupid. As you can see, after using my too-small hole bit, I traced a small section of PVC. I was able to take this to the router table and enlarge the whole freehand. 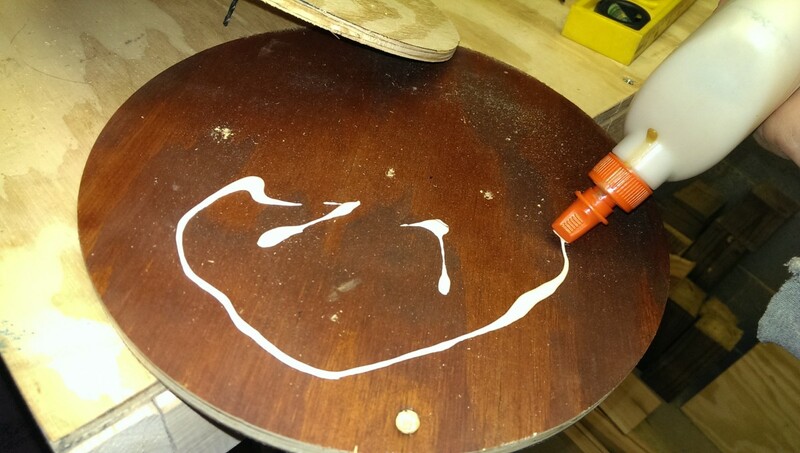 Unless you’re really good at routing, again, do not do this. It turned out OK, but I would have gotten a much nicer hole if I had simply bought a bigger bit. Do that twice, though, and you’re mostly done. 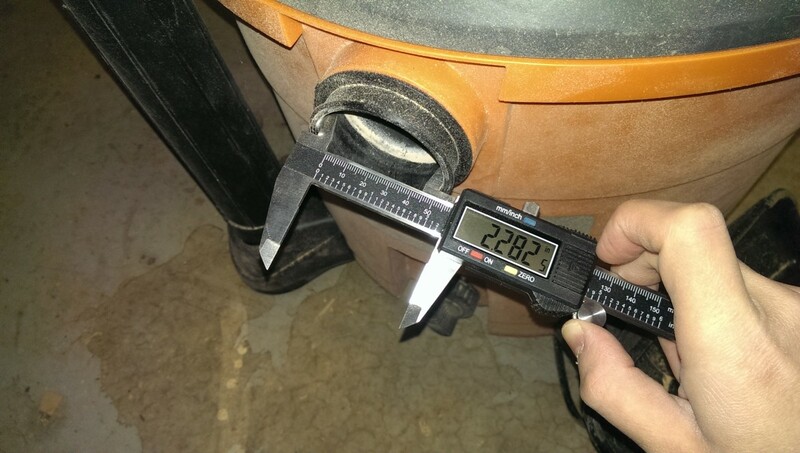 I was able to fit a 90 elbow + 2″ flexible coupler and a piece of straight pipe on. I put a screw in the straight pipe to hold it a couple of inches away from the baffle. I also put a screw through the elbow piece to hold it at a constant angle and keep it from moving around. I wanted to have it be removable as well, of course. 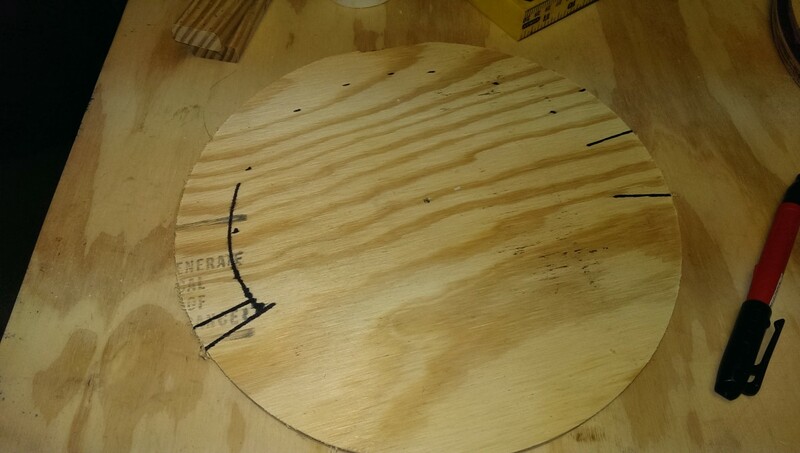 I ended up discovering that putting a huge rabbet on some scrap 2×4 let me just slip the wood into the holes near the shop vac handles. 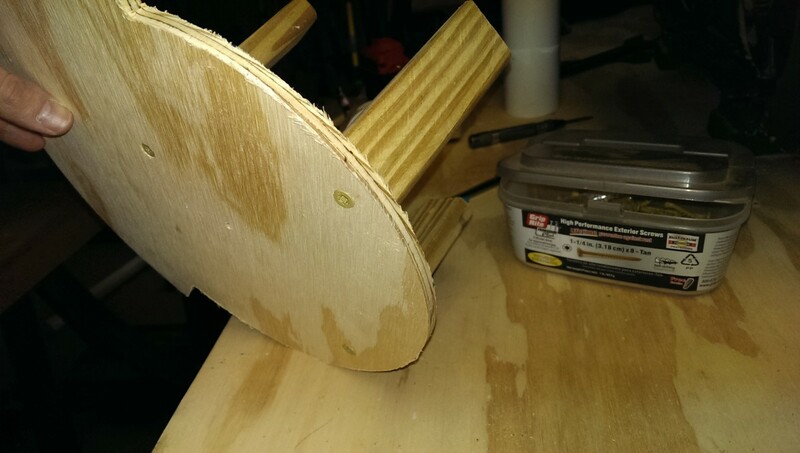 With one of these on each side, I could just screw some more 2×4 to it, and have myself a handy removable base for the separator. 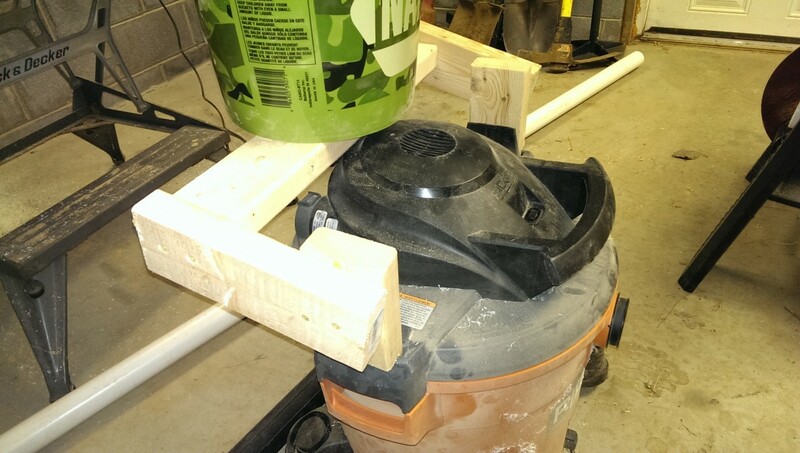 I ended up just screwing another couple of 2x4s to these supports, and then putting one screw through the bottom of the bucket into the support. When I want to remove the bucket to empty it, this support structure comes with it, but so far it has worked pretty well. It also took two seconds to throw together. 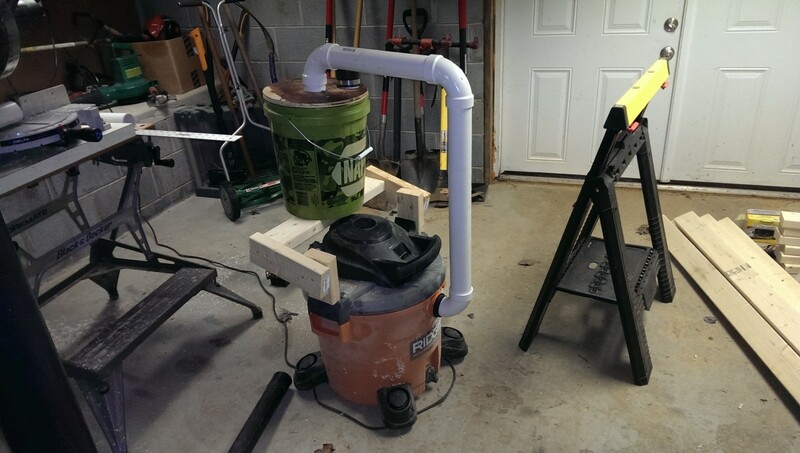 It’s worth noting that I intentionally built it so that the bucket is set back to where it is supported by the shop vac, but doesn’t cover the fan. Now it was time to plumb it. I ended up having to shave down one of the elbows just slightly to get it to fit into the shop vac. 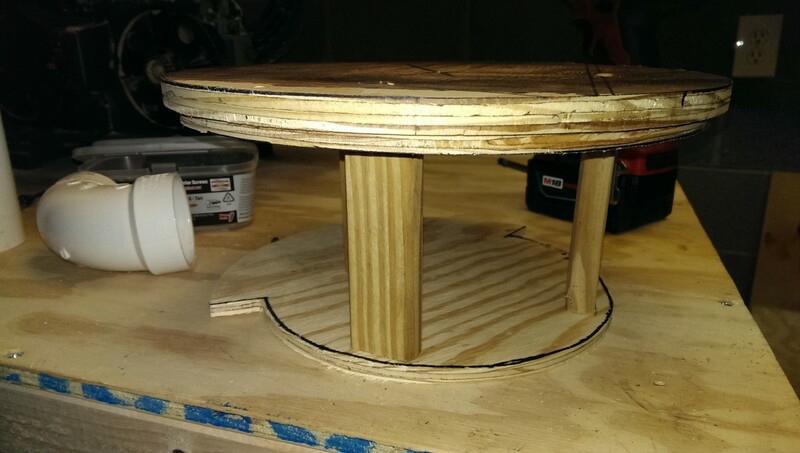 This was quick to do with a router bit in the table, but a sander might have worked too. Alternatively, I could have looked for a better fitting to use, but I didn’t. Oh well. The rest was a simple matter of cutting and connecting some PVC, which should be easy peasy if you ever had legos. 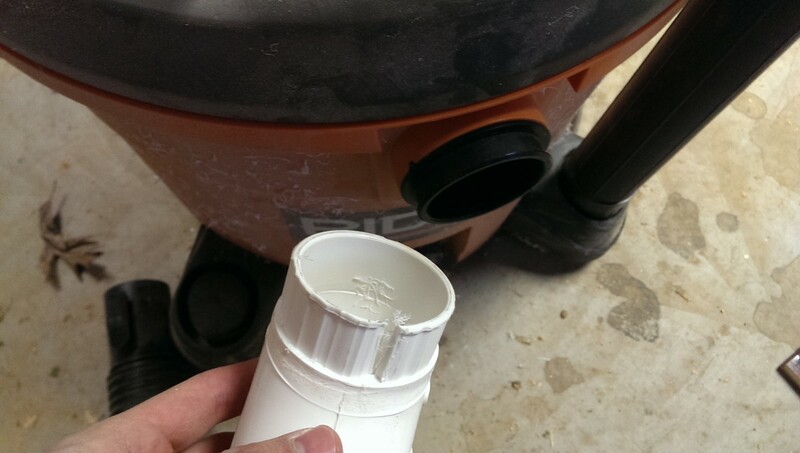 The center hole in the separator connects to the shop vac, the elbow outer hole connects to the hose. 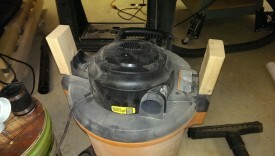 When I take the shop vac out, i just pull the pipe out of the separator and turn it to the side, then lift the bucket. I could probably find a better system, but it works well enough so far. The real test was seeing if it actually picks up dust. As you can see, it does a great job. After less use than you’d think, I had an inch or two of sawdust that made it into the bucket rather than my expensive shop vac filter bag or my lungs.